Grilled bananas top a buttery, crispy crostini with a rich and smooth mascarpone spread. 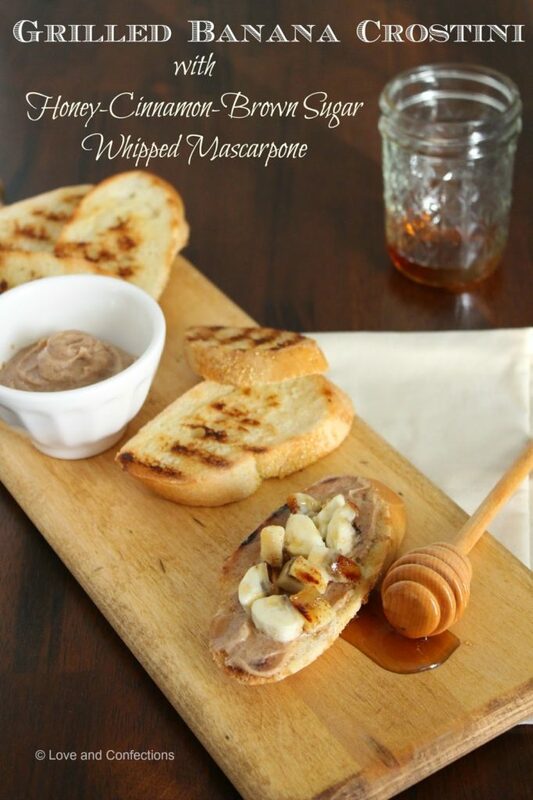 Grilled Banana Crostini with Honey-Cinnamon-Brown Sugar Whipped Mascarpone is an easy, decadent, and delicious dessert or snack for any day of the week. This dessert title is definitely a mouthful, and it may seem like a dauntingly difficult thing to make, but it really isn’t. These crostini take maybe 15 minutes from start to finish and are so delicious and satisfying. Let’s talk about the whipped mascarpone. Mascarpone by itself is so good. It is great in both sweet and savory dishes. I use it with pasta and red sauce – like lasagna or baked ziti, and in tiramisu and frosting – like a cream cheese frosting for cupcakes. I could just eat this whipped mascarpone with a spoon, it is that good. 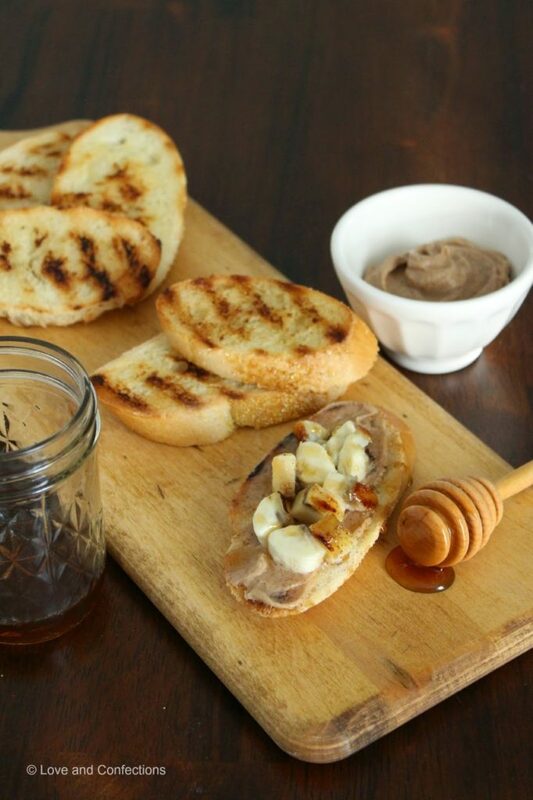 It gets even better when it is on top of a crunchy, buttery crostini. I usually use a small French or Italian loaf when making crostini because the nice hard crust gives it some stability. Slather it with butter and put it on a grill and you are good to go. I have a very, very, very small grill. It can cook like 4 hamburgers at a time and takes 1 hour for the charcoal to get good and hot. I am all for getting that good smokey grill flavor, but lately easy dinner and desserts are on the menu, since Baby L&C is days away from turning 1 and starting to walk everywhere and get into everything. 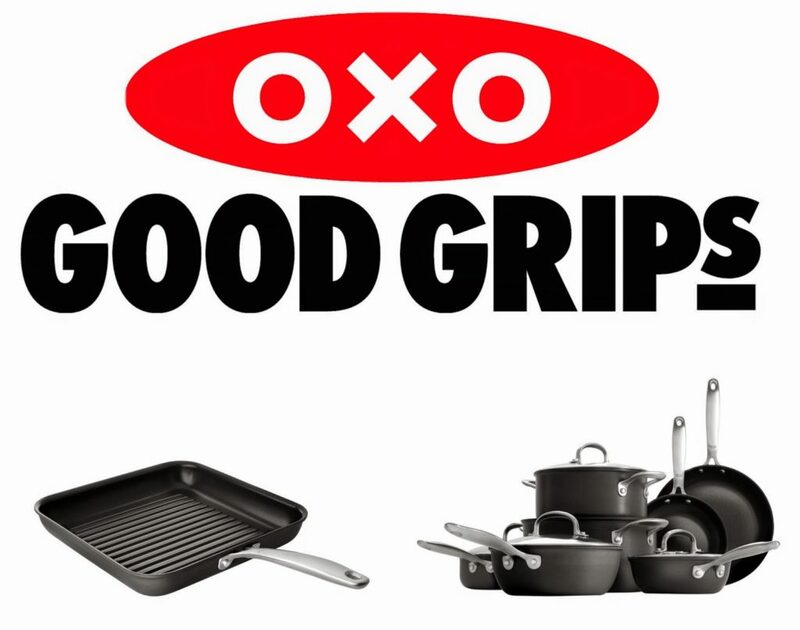 OXO just released their new line of cookware. I love OXO products and couldn’t wait to try out their newest collection. The Non-Stick Pro 11 Inch Square Grill Pan is such a great addition to any kitchen. It gives food those lovely grill marks without having to go outside and play with charcoal or gas. What’s even better is that it can go from stove to oven and is dishwasher safe! I have a few more recipes in mind for this Grill Pan and cannot wait to make them. The new OXO Cookware should definitely be on your holiday wish list! 1. Heat Grill Pan on medium heat. Slice Bread into 1/2 inch pieces and Butter both sides. 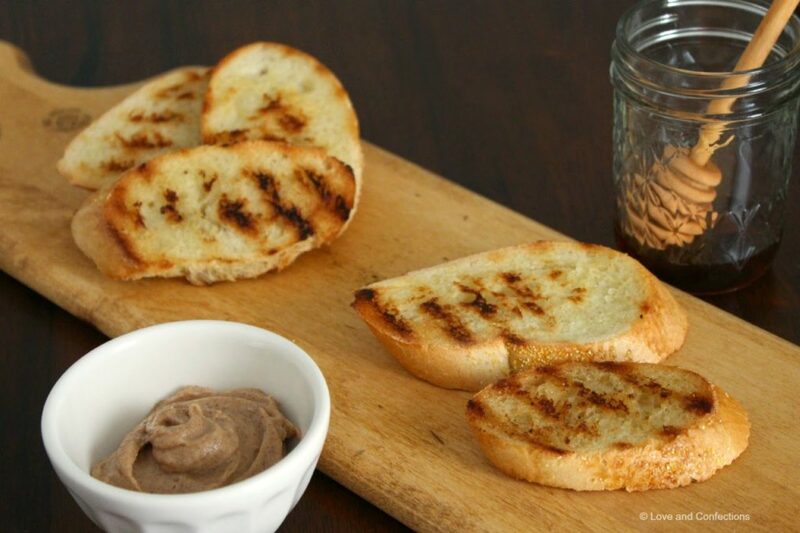 Place the crostini, half at a time, on the grill pan for 1-2 minutes, or until crispy, brown and with grill marks. Flip over and cook the second side. Remove crostini to a plate and repeat with remaining bread pieces. 2. Place Bananas, fruit side down, onto the grill pan and cook for 1-2 minutes or until they have nice grill marks but are not burnt. Place on a plate, remove the skin and dice. 3. In a small bowl, whisk together the Honey, Brown Sugar, Cinnamon and Mascarpone until completely combined. 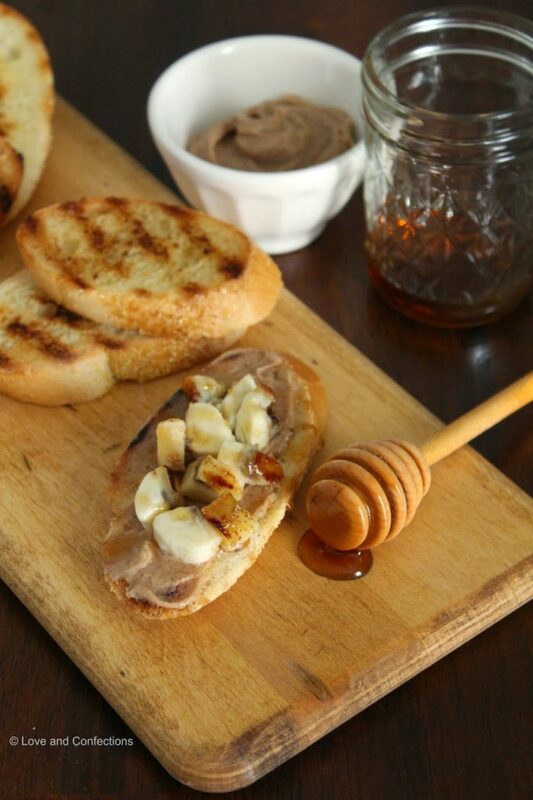 Spread onto Crostini and top with Grilled Bananas and optional drizzle of Honey. Enjoy! Disclaimer: I was provided an OXO Grill Pan for review as well as one to give away to my readers. All opinions are my own. This post contains affiliate links. 3-Ply Stainless Steel Pro 11 inch Square Grillpan for rainy day grilling! I don't know if my previous comment went through! :-/ this recipe looks awesome though, so tasty! I would want the 3-Ply Stainless Steel Pro 10 inch Covered Skillet because it is so versatile being oven safe. The glass lid is so nice! I would really like the 10 Piece POP Container Set. Great storage containers! I'd go for the non-stick pro 12-piece set. I love that it's dishwasher safe! I would love the Non-Stick Pro 8 quart Covered Stockpot, this could be used to make some of my turkey chili in. Love the look of this pot. I would like the 3-Ply Stainless Steel Pro 3.5 qt Covered Saucepan. I really need a new saucepan. I'm definitely in need of the 8-qt covered stockpot for making bigger meals! Thanks for the giveaway. I'm interested in the Non-Stick Pro 8 qt Covered Stockpot because with holiday gatherings I could stand a pot that would handle larger quantities. I have always wanted a wok! The 3-Ply Stainless Steel Pro Covered Wok looks fabulous!